INDUSTRY.co.id - Jakarta, Minister of Communication and Information Rudiantara said that the Government of Indonesia is currently on the right track in developing the digital economy. Quoting McKinsey & Company research, Rudiantara shows that the government has prepared and built a digital economic ecosystem. "Earlier I got a leak about the results of McKinsey's research, one of the recommendations is to build a digital economic ecosystem. And that we have done, the Government is on the right track. We build an ecosystem so that the digital economy in Indonesia is more competitive," he said at the McKinsey Latest Report Launching & Company about Nusantara Digital at Ritz Carlton, South Jakarta, Wednesday (08/29/2018). In addition to the Palapa Ring infrastructure that will connect all regencies and cities in Indonesia with fast internet network in 2019, the government also changes its mindset to stay ahead to facilitate and accelerate digitalization with the policies and services provided, including licensing. "The government must be ahead of the curve, by facilitating and accelerating so that the digital ecosystem can run. I believe the best regulations are less regulate. We have already cut down the licenses at the Ministry of Communications and apply sameday service. if the afternoon is submitted then tomorrow morning can be obtained, "he explained. Even at the Ministry of Communications and Information Technology targets the emergence of 1000 digital start-ups and Next Indonesia Unicorns to encourage the development of the digital economy. On a global scale, Rudiantara told how at the G-20 State Digital Minister meeting, Indonesia submitted a proposal and was accepted as an initiative to utilize digital technology to reduce social and economic disparities. "I was just from Argentina, where we proposed a proposal to utilize digital technology. The key is in sharing economy, worforce digitalization and financial inclusion," he explained. According to the Minister of Communication and Information, this was not only done by the Ministry of Communication and Information. "I am sure, all friends in other ministries and also at the Presidential Staff Office do the same thing. We want to ensure digital economic growth in Indonesia is more competitive," he said. McKinsey & Company released research results titled Nusantara Digital: How online trading drives Indonesia's economic development. The research explores and presents data on the scale of the online trading market, socio-economic impacts, factors and ways to overcome challenges and recommendations for realizing Digital Indonesia. "The reality of the digital economy in Indonesia is built on three key things, namely the digital economy ecosystem, talent or human resources and the empowerment of medium-sized businesses," said Managing Partner of McKinsey & Company Indonesia, Philia Wibowo. Previously, the Head of the Staff Office of President Moeldoko assessed the digital economy in Indonesia was not only a potential, but an extraordinary power. "We have tremendous potential because Indonesia has built infrastructure. Indonesia has this type of potential but how is this potential expected to be a force that is expected to build a nation and to build villages, build from an economic standpoint but in a broader context," he said. According to Moeldoko, the Government has also developed electronic-based services to serve and facilitate the community. "The government has also tried to improve the ease of doing business. And just launched an online single submission. We hope that all matters can be resolved quickly," he said. In Moeldoko's view, digitizing if utilized can have a tremendous impact, even leapfrog is lura imagined. "Kenya leapfrog by increasing people's productivity and competitiveness. Therefore, the President of Indonesia also spent government regulations on e-commerce road maps by focusing on eight aspects ranging from funding, taxation, consumer protection, education and human resources, logistics, infrastructure communication, cyber security and implementation management, "he said. With that reference, according to the KSP Head, the government places digitization as part of the ecosystem. 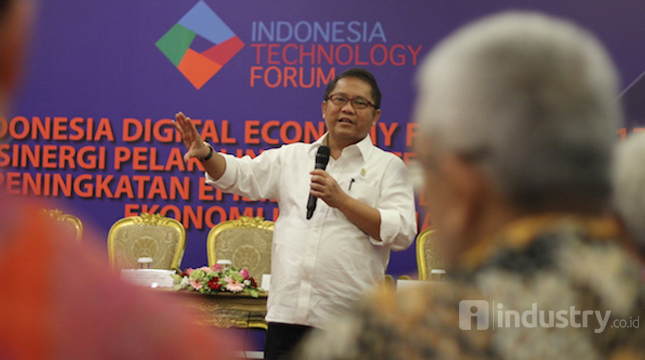 "The government provides services to its citizens, also cooperates with the private sector, consultants and academics to develop Indonesia's digital economy innovator ecosystem," he said.